I wanted to let you know about Miro's astounding progress after tendon surgery. 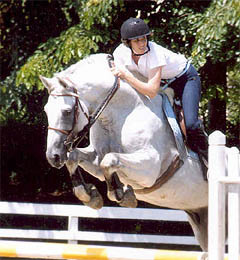 In March 2006, Miro’s vet conducted a sonogram and asked us to jump cross rails for 2 weeks and see what happened. So, we started jumping some cross rails every now and then until the follow up visit came up. He then took another sonogram and he's authorized us to start jumping him .80 m (2.62 feet) and gradually go on to 1.20 m (3.94 feet) which he was jumping at the time of the injury! The vet is really happy with this particular case because his recovery has been excellent and in record time. The recovery time was expected to be six to twelve months and we were done in six! So, once again, I'm enjoying this luxurious and delectable stallion that the universe has provided thanks to you. Honestly, I cannot thank you enough for your great products and your wise and kind advice …..